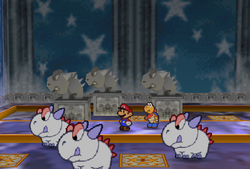 Albino Dinos are white colored variants of Dino Rhinos, hence their name, that reside in the Crystal Palace during the events of Paper Mario. Three Albino Dinos can only be found in the room preceding the Crystal King's lair. They are harmless and do not attack Mario or even move at all unless interacted with. In order to pass the Albino Dinos' room and battle the Crystal King, Mario has to solve a puzzle that involves pushing statues into the correct positions. In order to change the direction in which he can move these statues, Mario must speak to an Albino Dino in a certain manner, such as approaching it from the left side to make a corresponding statue face left. Albino Dinos were originally going to be an enemy species in Paper Mario; however they were removed as enemies from the final version of the game. The stats of the Albino Dino, along with Goombario's Tattle for them, still exist in Paper Mario's coding. This is an Albino Dino. He looks exactly like that stone statue over there. He's a guard for this palace. I never thought you could talk to these creatures! Wouldn't it be something if we made friends with these guys? You know, it seems that they like facing us when we talk to 'em. Tattle This is an Albino Dino. Albino Dinos are the guards of this frosty place. Max HP: 8, Attack Power: 4, Defense Power: 4 Fire attacks won't work. Their defense power is huge, so let's reduce their HP steadily using our strongest damage-dealing attacks. This page was last edited on March 27, 2018, at 13:41.